Even God of War’s splash screen is part of its one, long, continuous shot. Kratos glowers, ax in hand, at one of the birch trees that his wife Faye marked with a golden handprint before she died. “New Game” and “Settings” are superimposed on the trunk, the handprints of developer Santa Monica Studios. Select “New Game” and you’ll take control of Kratos, prompted to swing the ax to fell the final log for Faye’s funeral pyre. Plenty will happen to Kratos and his son Atreus as they journey from their one-room cabin to the highest point in the realm. The shot that begins with Kratos brandishing his ax will capture everything that follows. Even after the exiled God of War and his son have scattered Faye’s ashes, as they saunter down the mountain— developer credits flashing by— the camera remains a constant. As Kratos and Atreus head back into the open world, campaign finished, the tape keeps rolling. 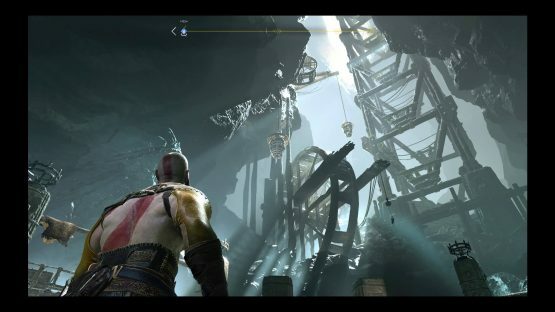 Much was made about God of War’s no-cut camera upon release. Critics praised the decision for its sense of intimacy and its ability to deliver an elevated intensity. Whatever happened to Kratos happened to the player. It provided the feeling that we were following the father and son from the beginning of their journey to the end. Let’s be clear: all of that is true. Little attention has been paid, however, to the way God of War’s no-cut camera ground its unbroken open world story. Most folks who have completed a nonlinear game’s campaign know that continuing to play in a sandbox after you’ve defeated the final boss is often an anticlimactic kind of time travel. As Horizon Zero Dawn’s Aloy, we launch one last bomb from our slingshot, felling the most powerful whirring, jagged machine in an onslaught of corrupted chrome and wire. We smile up into the sky, the sun of a new day lighting up our face. Credits roll. And then, suddenly, we are standing in a field, or in a town, or on a desert plateau, the same field, or town, or desert plateau we occupied an hour before. The robot army remains ready and waiting. Our XP remains a little bit lower. Our story remains unresolved. We take an unrewarding leap of faith every time we dive back into an open world game we’ve already finished. We’ve seen our character grow; controlled their steady hands as they landed the final blow on their toughest foe yet. And then, we’re plopped back into the world, unceremoniously, as if all those moments were a dream. God of War’s seamless camera provides a context for it to do something different and far more interesting. Sony Santa Monica allowed Kratos and Atreus’ journey to continue after “the end.” “Shouldn’t the story be over now?” we may wonder. The camera, still rolling, answers: “No.” And, when we arrive at the bottom of the mountain, we see something that open world games rarely allow us to see outside of the confines of a closing cutscene. We see the ways that our actions have impacted the world around us. While the player can continue to hunt down Valkyries and finish up side quests, Kratos, Atreus, and talking head sidekick, Mimir, will comment on the snow that now drifts from the dreary sky; on the frost that now crackles as Kratos guides their canoe through the game’s central lake. Fimbulwinter—the long winter that precedes the apocalyptic events of Ragnarok— is here. We played a key role in its arrival. The long tracking shot is technically impressive to be sure, both in movies and in games. The recent films of Alejandro G. Iñárritu have used this technique to stunning effect. 2014’s Birdman is nearly two hours long, and all but a minute or two of that runtime unfolds without cuts. The Revenant, Iñárritu’s 2015 follow-up, uses these shots more sparingly, but opens the film on a prolonged glide along the surface of a murmuring brook as Leonardo DiCaprio’s frontiersman, Hugh Glass, and his son, Hawk, silently raise their rifles to shoot down a hulking elk. Tracking shots are employed again minutes later as a trapping party that Glass and Hawk are guiding is assaulted by a barrage of arrows from an unseen Native American war party. In both films, the long shot builds tension. Set in a theater during the rehearsal and performance of a Broadway play, Birdman uses the tracking shot to recreate the “anything could go wrong” feeling of live theater. The Revenant, likewise, uses the technique to foster the quiet unease and sudden violence of hunting (and of being hunted). The camera’s refusal to look away holds the audience spellbound, in a state of unbroken tension. Movies are able to achieve this effect because the audience knows that, somehow, they pulled it off. The director, crew, and actors have created something that is not born of judicious editing, but produced in one perfect take. This is not the case in games. The actors on the screen are digital creations. The developers are rigging shots in a space where they have godlike control. The “How the hell did they pull this off?” fades away, as does our awareness of the camera’s lingering presence. We forget that it’s even there. Instead, the no-cut camera is useful for building the seamless world that open world games have long touted. Kratos and Atreus’ trek through their world is conveyed to us as one, unending narrative. This is only possible because of the camera’s dogged persistence; its resolve to render everything to us as an unbroken whole.